We didn't intend to cover the same series two weeks in a row, but recent developments in the world of Virtual Console made a discussion of a Konami RPG for the MSX2 computer seem timely. Maybe, we thought, our prayers for Snatcher caused the universe to swing things our way a little bit. Well, here's another appeal. SD Snatcher takes the violent, gritty, sci-fi detective story of Snatcher, and presents it as a turn-based RPG populated by big-headed "super deformed" characters. We choose to believe this decision was some postmodern playfulness from Hideo Kojima-- deliberately downplaying the dramatic aspects of his game and overlaying obvious videogame conventions on top of it, like when Psycho Mantis in Metal Gear Solid read your memory card. Or it could just have been that Japanese gamers like RPG's a lot. There are, unfortunately, plenty of valid reasons Snatcher hasn't been released on the Virtual Console yet. Only two MSX games have even been announced for the VC, and none have been released. No mention of the MSX2 platform has been made. It's unclear whether the later iteration falls under the "MSX" category in the VC or not. Also, the original Snatcher has yet to see a VC release, and the original would almost certainly come before the remake. And unfortunately, no Japanese games without existing American releases have been released on the American VC. 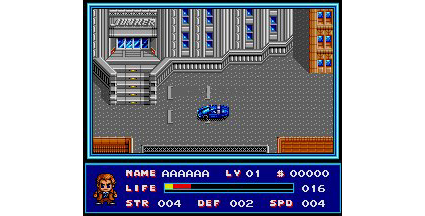 The first Snatcher was a synthesis of all the sci-fi movie characters and scenes that appealed to Hideo Kojima at the time, mashed up into a visual novel. But it wasn't really videogame-like in the traditional sense. What Konami did with SD Snatcher when they applied the JRPG template was add another level of abstraction. It's like reading a comic book of a novel of a movie -- it can be really interesting to see how the same story gets told in different media. And for such a mature narrative, it's unusually jarring to add hit points and random battles and, especially, stubby SD characters. Within videogames, SD Snatcher represents a rare event: the remake in another genre. This is so rare, in fact, that we can only think of a single example: the upcoming action-RPG remake of Kingdom Hearts: Chain of Memories, which was originally card-based. The Typing of the Dead is close, but it is more of a port than a remake. In fact, it's hard to even call it a port, because it was released on the same systems as The House of the Dead 2. Novelty aside, here's the bottom line. We need RPG's on the Wii, immediately. They can be new or "new to us" like SD Snatcher. At least this one has a cool setting, the likes of which are never seen in traditional RPG's. There aren't enough futuristic RPG's anywhere. Sure, Xenosaga is futuristic, but it's also Xenosaga. If you'd like to chat about SD Snatcher, or about adaptations, or MSX games, or Kojima, or the Virtual Console in general, please, make use of our comments thread. And join us next week, when we try really, really hard not to talk about Policenauts.